Over the past few months, Jared and his family in Ohio spend their spare time reconstructing an army themed MINI-Beep, thanks to the project kit and easy to understand directions available through Struck Corp.
“I loved doing this project!” Jared shares, “The plans were very user friendly and made the project easy to visualize.” Both Jared and his children worked on each phase of the small jeep reconstruction together. Jared found the MINI-Beep plans online from Struck Corp, but he knew he wanted to make a few modifications as he went along in order to achieve the most authentic results possible. He started by making a V-cut in the side panel about three-fourths of the way through, and then steaming the plywood to get a bend and maintain the aesthetics of a continuous surface. Instead of purchasing the metal hood, he went to a specialty shop and purchased 1/8” plywood. After soaking the wood for 24 hours, he was able to shape it into place, before adding a layer of bonding, primer, and paint. Since he wanted the MINI-Beep to run like a golf cart…quiet, electric, and with a similar parking break. 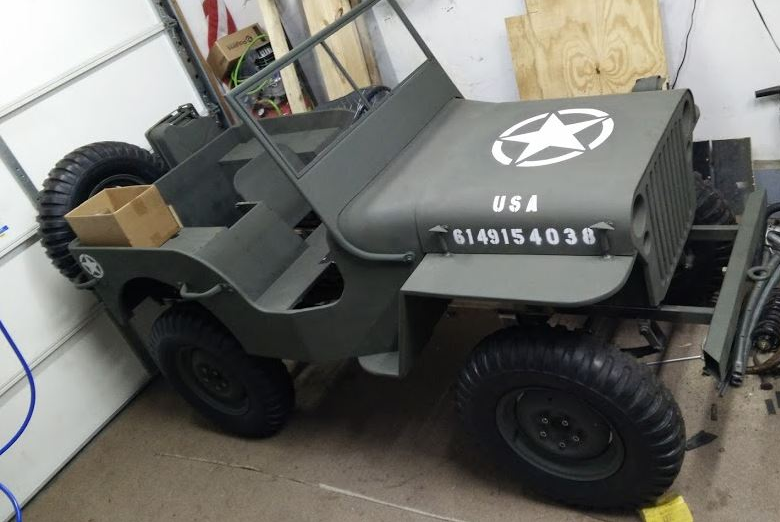 He purchased an old golf cart for about $500 to use as his “donor” vehicle, before using it’s steering and driving components, along with modifying its suspension for the new frame. You see, Jared has several family members who have served our country. His Great Grandpa Ernest served in WWI, Grampa Miles and Grampa Net in WWII, and he also lost his friend, Jeff, who gave his war in Iraq. 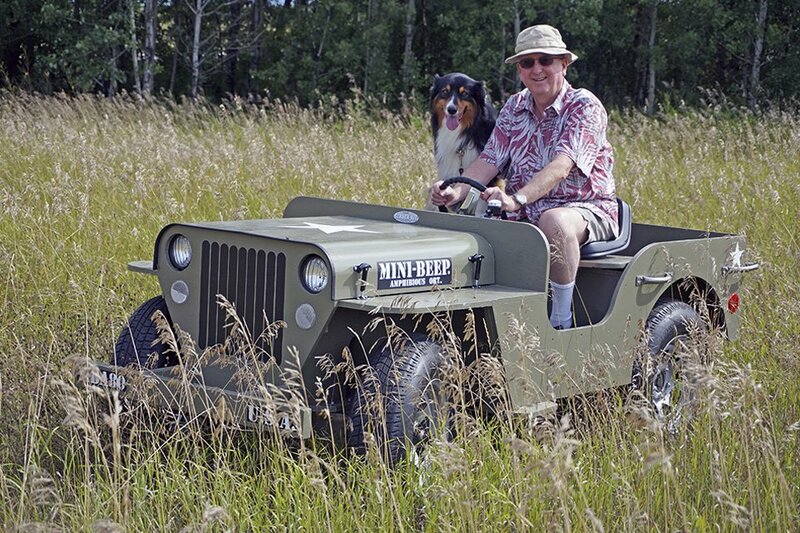 This unique version of the MINI-Beep is inspired, of course, by military vehicles that have been used over the past several decades. Instantly recognizable, the classic frame takes veteran’s and their families back in time. Not only is it perfect for Veteran’s Day parades, it serves dual-duty for everyday chores around the small farm. Build Your Very own Amphibious Off Road Truck! I have a video of this running. https://youtu.be/M07H2hdUajM Thanks for looking!